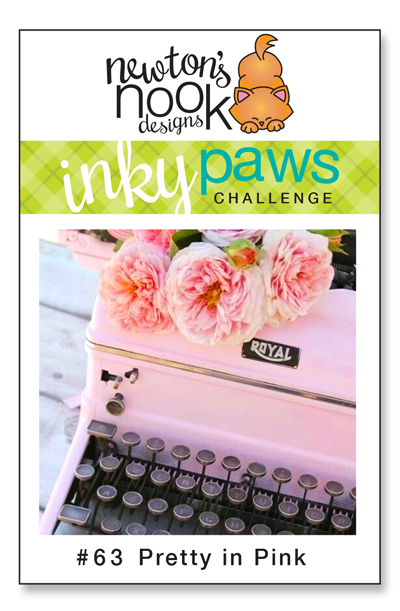 Create a project using the theme: Pretty in Pink. You have TWO WEEKS to play along - Deadline to enter is Friday, January 19, 2018 at Midnight CST. The winners will be announced on the NND blog the following Monday. 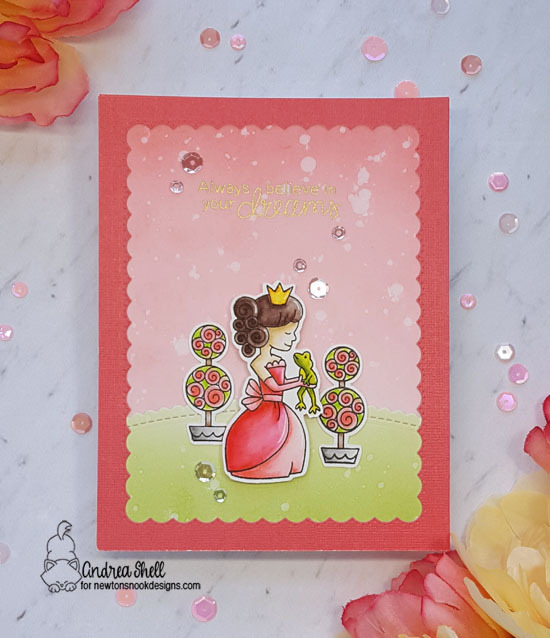 Andrea Shell creates a scene of fairy tale magic with this charming card using Once Upon a Princess stamp and die set. Love the soft water colored background with the splattering of sequins! 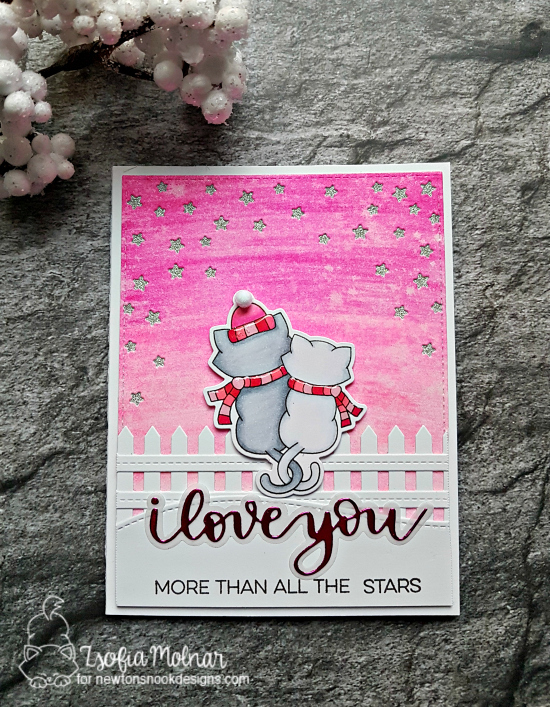 Debbie Owens is celebrating in pink with this darling card! 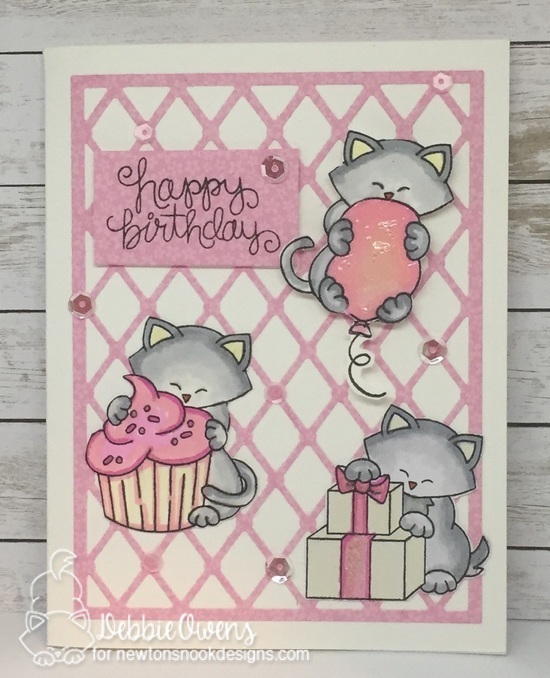 The lattice provides a nice textured background to showcase these three, sweet felines from Newton Loves Cake and Newton's Birthday Bash stamp set. Diane Morales brings us a slice of Paris with this charming card! She uses Pawprints stencil to create the prints in the background then adds the Parisian feline and Eiffel Tower from Newton Dreams of Paris stamp set. All of this with the black and white stripes--Wow! 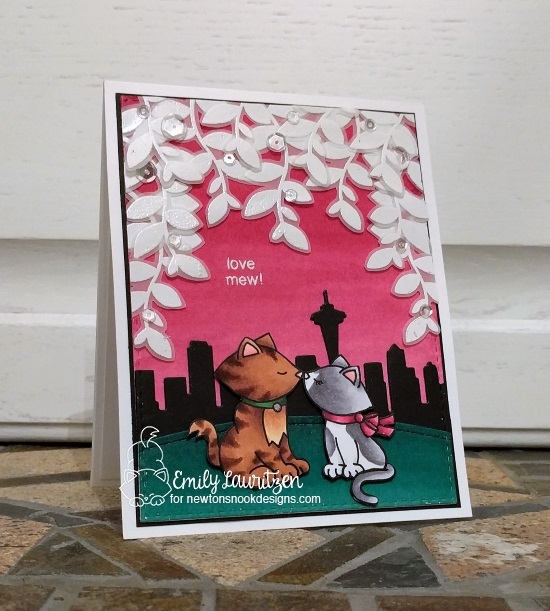 Emily Lauritzen creates this romantic card featuring those sweet felines from Newton's Christmas Cuddles stamp set. I just love her pink sky with those lovely leaves dangling down from Falling into Autumn stamp set. The sentiment from Newton's Antics stamp set is a purr-fect touch! Zsofia Molnar wows us with this amazing pink sunset! Those sweet kitties are from Newton's Christmas Cuddles stamp and die set. I love all the small touches Zsofia adds--Glossy Accents on the scarves and hat, the pom-pom, the silver stars! So cute! These cards are fantastic! With scenes featuring Seattle and Paris, they show Kitty Love around the world! 😊 Each one is very beautiful and well-designed! Thanks for sharing them! I am so sad I missed this challenge. Ready for the next one!